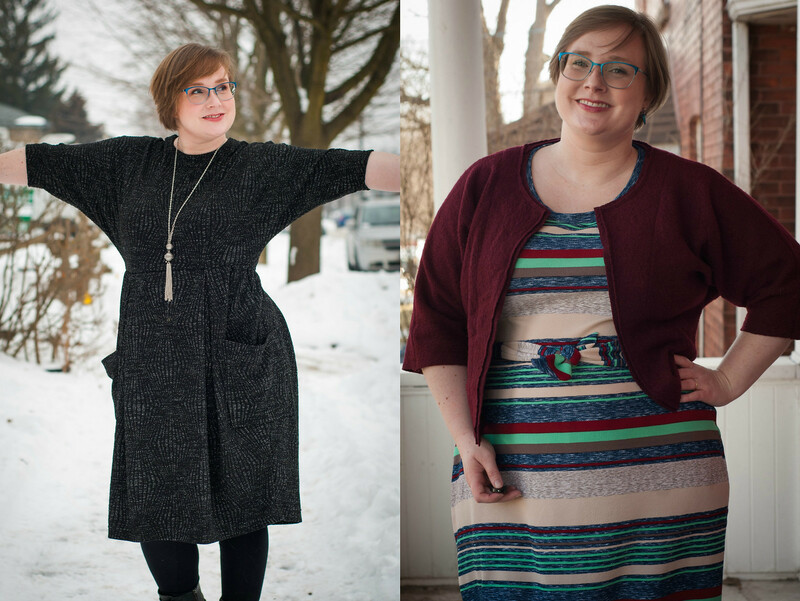 This year (ok, and least year) I’m working on making my style bolder, braver, and more fun! Using the guidelines for KIbbe’s Flamboyant Gamine body type has been helping with that, since it recommends strong colours and pattern, playful contrasts, and more-is-more style. I wrote about dabbling in Kibbe back in early fall, and you can find way more on Doctor T Designs where she is hosting #SewYourKibbe! With my latest outfit, I think I’ve reached peak Flamboyant Gamine! Underneath is a Cashmerette Pembroke, made in striped Liverpool poly double knit. I ordered this back in the fall and when I arrived I was skeptical of the beige and oatmeal stripes being too close to my skin tone… but my love of the teal and oxblood stripes eventually won out! I first made this pattern as a tester in a rayon, and wasn’t convinced about the sleeves… ended up taking them off, and had to raise the shoulders to avoid a giant armscye, and then the waist tie was too high! I’ve passed that version on now. 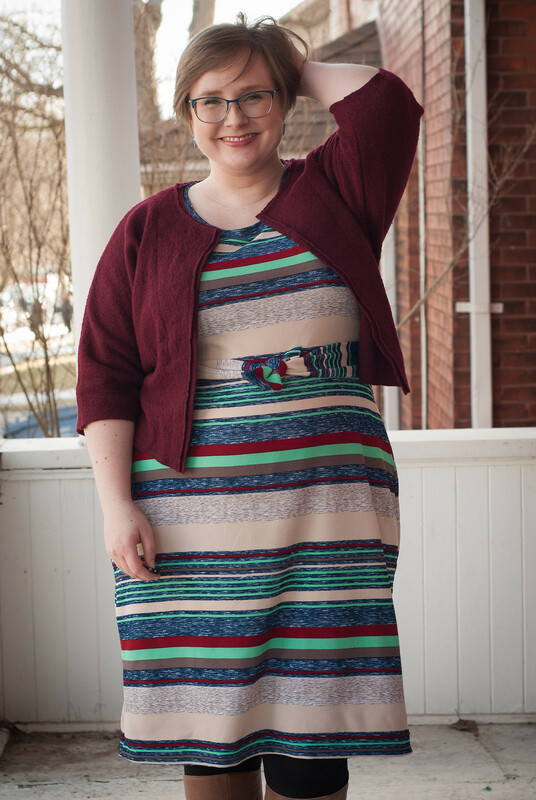 Then I used that pattern (before it was released) to make my Sew Style Hero dress with statement sleeves. Now I’m finally making a version I can blog about! Like most Cashmerette patterns, my booty needs more space. especially with the ties, this results in a major “swayback” fold of fabric at the back waist… but I’ve just been to lazy to add width and sort it out. This newest dress will probably always get worn with a jacket or cardigan, so I don’t really care about the back fit! Speaking of which, this maroon boiled wool jacket is my favourite part of the outfit! 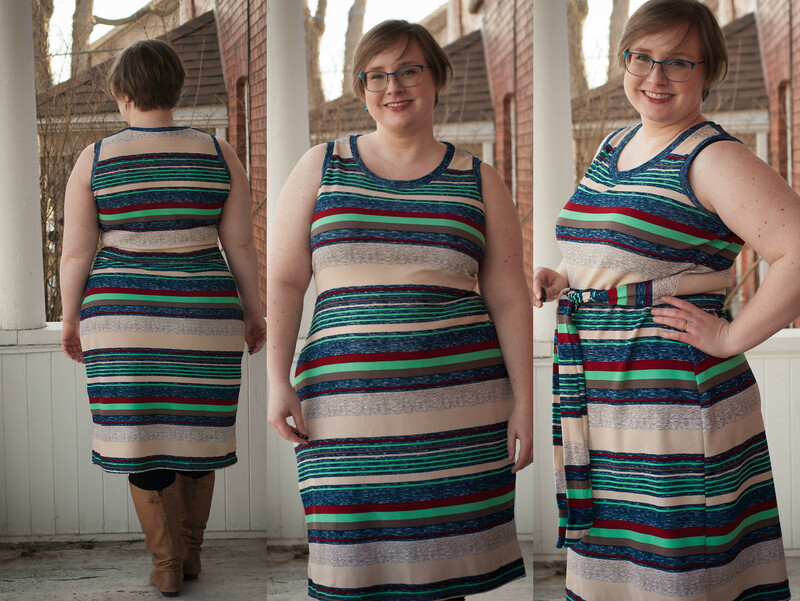 It is made with the bodice pattern pieces of this Burda batwing dress, and I love how it turned out! You see, I like the *idea* of boiled wool so much, but when I think of wearing a close fitting jacket I just imagine sweating into the wool and having to hand-wash it too often. I almost made a boxy kimono jacket from it as a result, but this shape is the perfect compromise! Tailored at neckline, wrist and waist, and boxy in between! The shoulder and side seams are sewn as normal, right sides together with the seam allowance hidden on the inside. For the facings though, I left the edges raw and sewed them on with the edges exposed. I trimmed back the seam allowance on the outer wool so that it adds a fun bit of detail. The bottom edge and the sleeves are finished with a row of topstitching to make sure the raw edge doesn’t stretch out in time. All in all, I feel cute and strong in this outfit! The Kibbe Flamboyant Gamine elements are the high neckline, sharp edges on the jacket, the mix of colours and textures, and the way that the stripes, waist tie and jacket break up the vertical line. 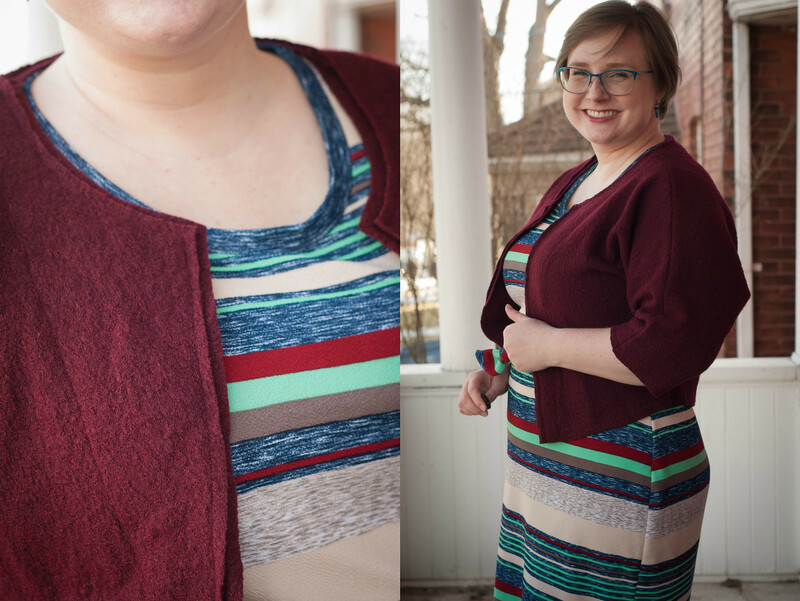 The classic Gillian elements are using two TNT patterns, hacking things on the fly, wearing stripes and bright colours, and the combo of slightly tailored with comfy knits! BTW… remember that post where I was 3 months post-concussion and sure I was about to be back at work full time? Yeah, I was wrong. It’s almost 5 months now and I’m working half time at least until Easter. Live and learn. Glad I can sew in the mean time – it’s the perfect quiet, solo activity that suits my brain right now! Great combo! The stripes look very fun and the Pembroke shape fits so well. I really like your jacket – here in Germany, boiled wool is still mostly associated with folk costumes (think the jackets you combine with dirndl and lederhosen :P) or elderly hippies. I love your more modern and structural take on it! While I wasn’t sold on Kibbe at the beginning, now I can appreciate how fantastic and authentic you look on this outfit, while I (a classic) can never pull off the trick of making voluminous clothing look chic if it’s just fitted at some points. I need (want) my clothed to have a structure that closely follows my body. Thank you for your terrific inspiration! I hope you’ll soon get over the effects of your concussion! It is very difficult to predict the progress of a Traumatic Head Injury. They are incredibly frustrating to deal with both physically and emotionally. Guessing you know all about that! This colour combo is gorgeous and suits you perfectly! It’s a great outfit! And I can definitely relate to wondering about the beige and oatmeal being too close to skin tone, I’ve been trying to avoid those shades as much as I can! A lovely outfit! A great combo which suits you so well. Thanks for the jacket info; I love the edging detail…I’ll remember that! What an awesome outfit. It suits you perfectly.